There’s no better sight than watching your dog enjoying the simple, natural pleasure of running. Whether fetching a ball, running for the fun of it or as your jogging partner, sharing these moments with your dog are some of the best times for the both of you. The ability to move around freely is also a sign that your dog is in optimal body condition, but just like us age can take a toll on their joints. It’s therefore important that as your dog ages you take extra care to look after their joints so they can maintain an active healthy lifestyle. Some dogs will be more prone to joint difficulties due to their breed and size, however there are some simple steps you can take to help your dog’s joints stay healthy for longer. Excess weight is the biggest cause of joint damage. Bones and joints are naturally subject to significant stresses and strains but carrying around excess weight increases these stresses, which over time leads to joint deterioration. Age slows down metabolic activity so, just like us, maintaining a healthy weight as we age is about balancing “calories in” versus “calories out”. 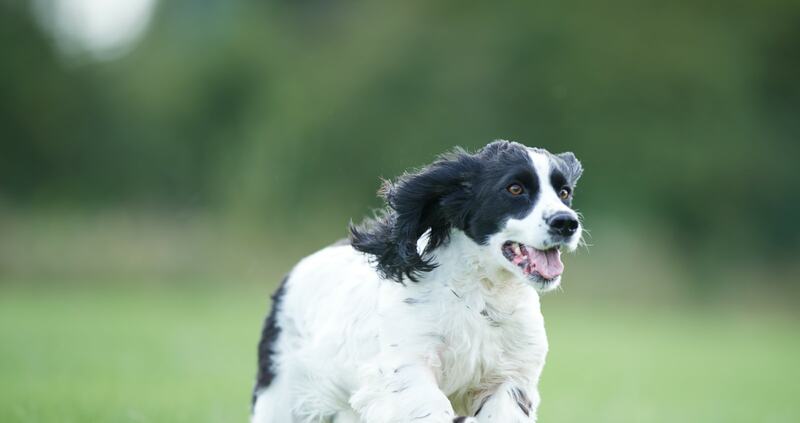 A regular gentle exercise regime combined with correct feeding is vital to keeping your dog in optimal body condition. Exercise also promotes muscle tone and it is these muscles that support the joints. Your older dog might not have the same boundless energy as when they were younger but they’re still a willing partner for a good run or game. Two periods of gentle exercise a day will be good for them and you! Older dogs are more likely to need a little extra help with their joint through the food that they eat. Mature dogs are in the 'middle-aged' phase of their life, around 6-9 years of age, depending on the breed size. Senior dogs are generally aged 8-11 years and older, but again it depends on the breed size at which age this threshold is reached. Larger dogs hit the 'senior' threshold around 7 or 8 years old, whereas smaller dogs tend to get there later, around 11 years. Mature and senior dogs can benefit from specific ingredients included in their diet that will help support healthy joints. Nutrients such as glucosamine and chondroitin help maintain healthy joints and mobility and calcium help support strong bones. The essential fatty acids omega 6 and omega 3 have also been shown to support healthy cartilage1. L-carnitine is a nutrient found in animal based sources of protein. It acts as a natural “fat burner” converting fat into energy. This helps maintain optimal body condition as well as supporting the joints. Look for dog foods made with animal protein such as chicken, lamb or fish rather than ones with protein from vegetable sources. High quality food from specialty pet stores, tailored to mature and senior dogs, should contain these ingredients. However, not all foods are the same so make sure you choose one that supports joint health and has animal protein as the first ingredient. If in doubt ask the pet shop staff or your vet. 1 Curtis CL, et al. Effects of n-3 fatty acids on cartilage metabolism. Proc Nutr Soc. 2002 Aug;61(3):381-9.